Formula DRIFT will return for the third consecutive time to Panama City for the annual demo that is part of Xtreme Wheels & Drift. The event will be held at the Figali Convention Center on February 12. Panama has a growing car culture of enthusiasts and a large fan base for drifting, who first saw professional action 3 years ago. 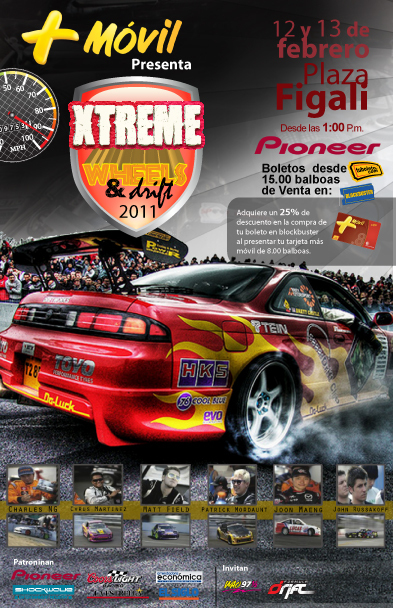 The drift demo held by professional Formula DRIFT drivers is held to help continue the promotion of the sport within the region with the goal to hold a professional event at a racetrack. Panama is a major focal point for commerce around the globe with over 14,000 ships, carrying over 300 million tons of cargo through the canal each year. Formula DRIFT drivers that will be participating include Joon Maeng, Cyrus Martinez, John Russakoff, Charles Ng, Matt Field, and Patrick Mordaunt.